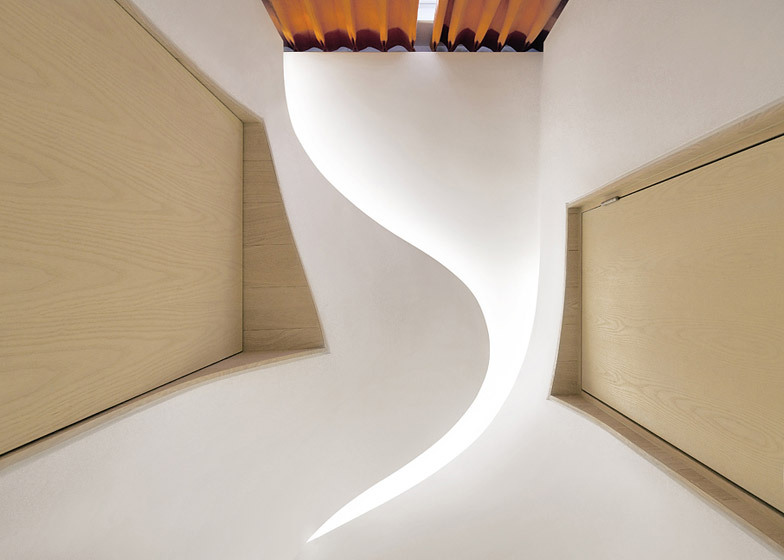 A warren of interconnecting spaces moulded to resemble melting snow form an après-ski apartment in China's Hebei province by Vienna and Beijing-based studio Penda (+ slideshow). 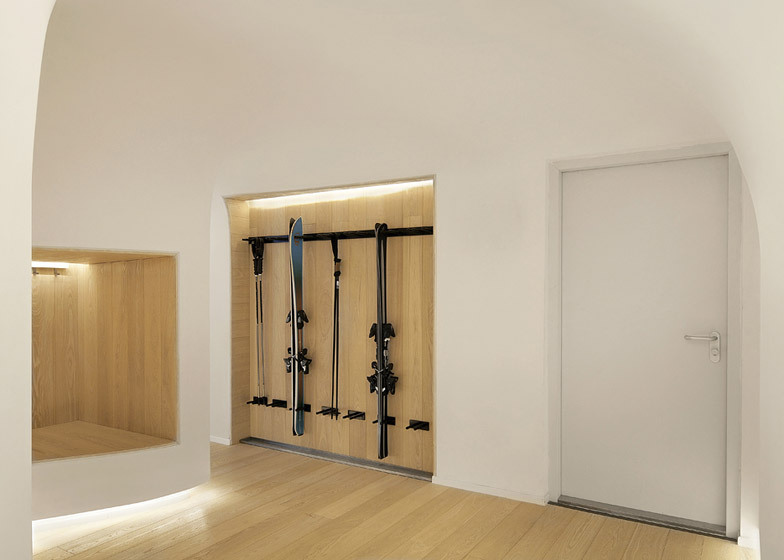 Located 160 kilometres north of Beijing in the ski resort Zhangjiakou, Snow Apartment was designed by Penda as a weekend retreat for the client and his friends. Set over two floors, the first level of the apartment accommodates seven bedrooms, six bathrooms, a cloakroom and a central living room. 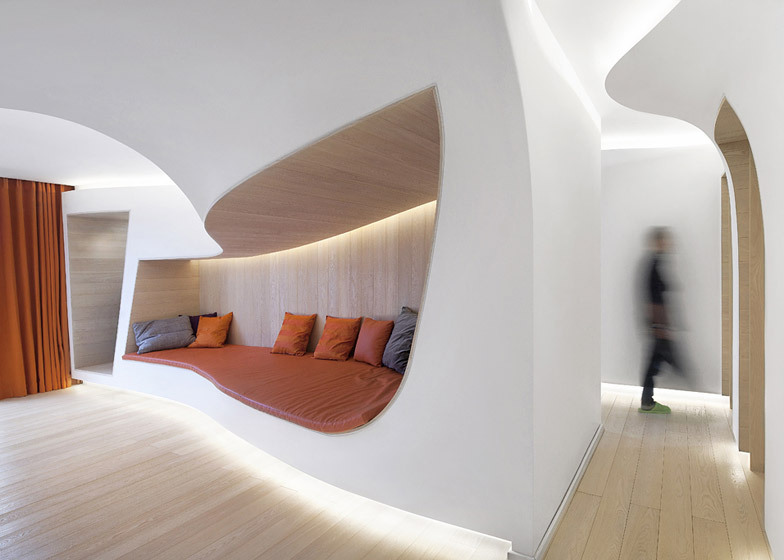 Thickly plastered contoured walls, intended to resemble partially melted snow, line the hallway that sweeps around a central circulation well connecting the upper and lower floor. "The design of the apartment is inspired by a melting snowfield in spring, when nature slowly revives from winter," said a statement from the designers. The undulating plasterwork floats five centimetres above the fir floorboards, disconnecting the walls and ceiling from the floor of the property. To produce the curved shape of the walls, plaster was applied over a series of hand-constructed arches formed from individual wooden slats. To maximise space, bathrooms, storage areas and stairwells are exempt from the plastering technique. The walls are plumbed with a network of heating pipes that, according to the architects, emit a gentle warmth to give the sensation that the walls are slowly thawing around their edges. 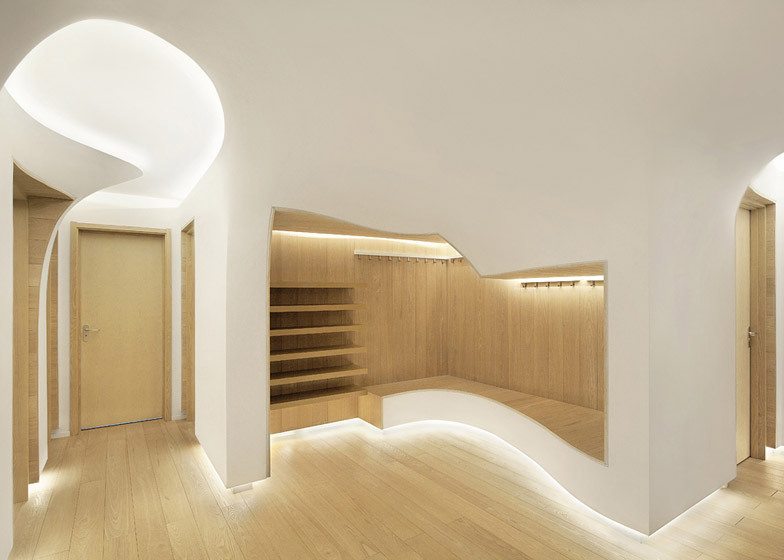 LED lighting positioned in the gap between floor and wall, and along the top of each alcove, gives a peripheral glow to the walls. The whitewashed walls are also inset with a series of fir-lined alcoves providing storage space, ski racks, seating areas and nooks for flat-screen televisions. Textiles in a palette of oranges, purples and warm greys soften the wooden seating areas and drape around the windows to offer "a contrast of cold and warm, white and coloured." Glass shelves and plinths displaying artworks dot the corridors. 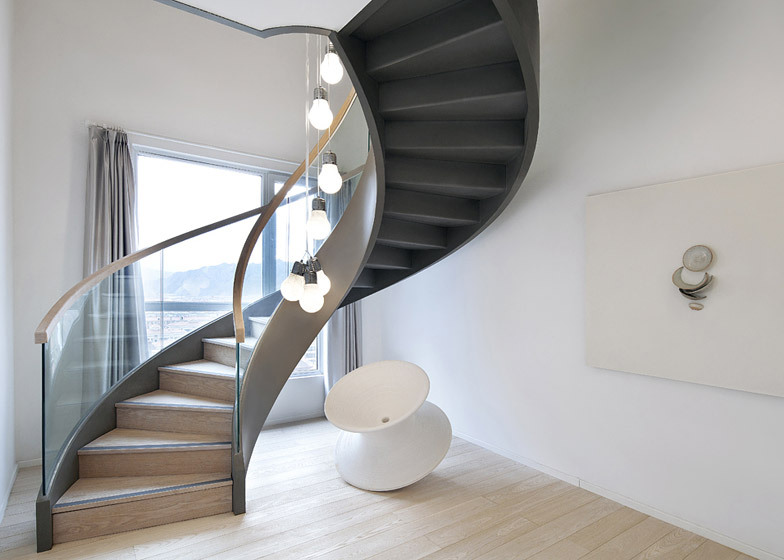 The client has hung paintings on the walls of the stairwell, taking advantage of its flat surfaces. Sculptural works sit directly on the floor and a cluster of unshaded lightbulbs are suspended from the centre of the staircase. A centrally located lift and spiral staircase at the rear of the property provide access to the upper floor, named the Ice Apartment. 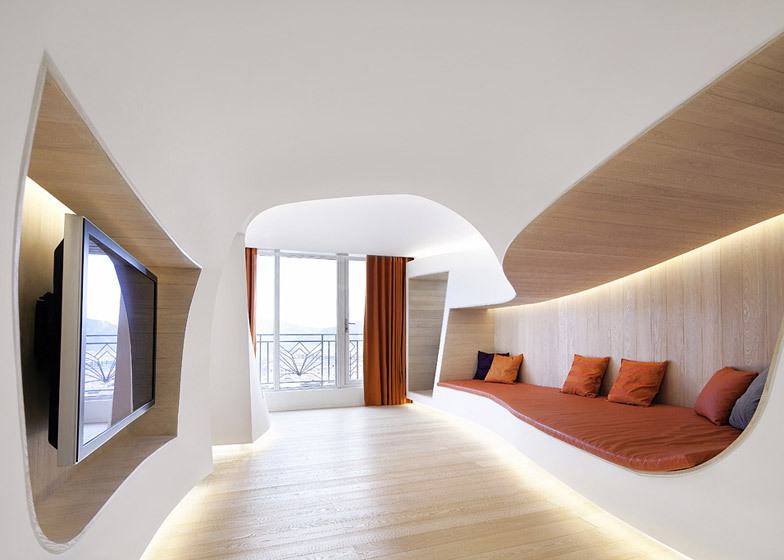 This space offers an angular and cool-toned contrast to the curves of the ground floor of the Snow Apartment. Downstairs, formal bar and dining areas cater to guests and provide access to a roof terrace that overlooks the surrounding mountainous terrain.